I first saw this idea on Pinterest and the blog post it eventually led to (it was a round-the-houses kind of link-up) was a couple of years old, so I guess there's room on the internet for my version too. 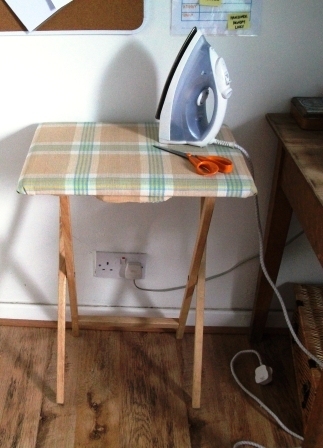 Sometimes, it just seems silly getting a full-size ironing board out just for pressing a couple of seams. Well, this table is so small it can sit permanently by my sewing table. I like that. Now maybe I need a spare iron to sit there permanently too, so the man of the house doesn't get annoyed because I've left it in my sewing room yet again when he wants to do the ironing. Yes, you read that right, he does all the ironing in our house. No, I don't hire him out, sorry about that. I started with one of these TV dinner tables. I used to use them at craft fairs but don't really need them for that purpose any more. If you need to buy one for this project, they're usually quite cheap. Mine came from Dunelm Mill and was about £6.00 but I know a lot of people have got one of these in a neglected corner gathering dust. 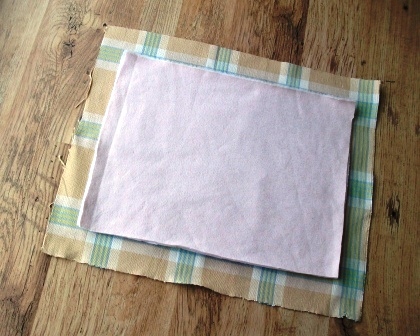 Cut a piece of thermal wadding the same size as the table top. To add a bit more padding, I popped a layer of fleece under the thermal wadding. Thermal wadding has some heat protection, so should protect your table top at least somewhat. You could cut it larger and wrap it round (gives it a more padded look at the edges) but I thought this was a bit of a waste of something I need for other projects! 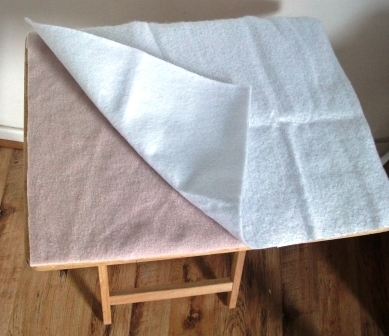 Then cut a piece of heavy-duty cotton furnishing fabric, large enough to wrap around the table top and go underneath. Furnishing weight cotton is a good fabric to use as it will stand a hot iron. If you want a neat finish, you can use pinking shears - I didn't bother. 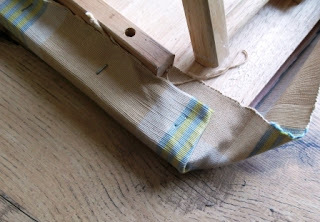 Wrap the fabric around the table (work from opposite edges in turn, so you can stretch the fabric lightly across the table top) and staple it in place at intervals on the bottom edges of the table. Work carefully around the corners, folding under to get a neat finish. Turn the table over and - ta-dah!! - you have a cute little ironing table for your sewing room! If you don't have room for it to stand there permanently, it is easily foldable and takes up almost no room at all. .....and now I have a confession: my husband does all his own ironing, AND the sheets and sometimes tablecloths! I do my own, of course.......when I get round to it. My mother would kill me if she knew. But hey, I have other more important things to do. And actually, I am a very good ironer, when I have to do it... I was well taught. I just hate it. Unless it's quilting fabric, of course. Yes, I hate it too. People stop in their tracks and offer to take a picture if they see me in front of an ironing board! OH not only does his ironing, he does mine too. And the washing, washing up and cleaning. I do the cooking and gardening though - I have to contribute something apart from *ahem* my creative mess!! Your little table looks so cute! I have a similar arrangement with a couple of old cloths sewn together - thick enough to be insulating but not so thick it can't be folded and put away. 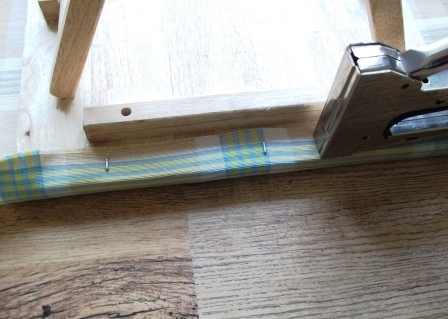 I also use a little travel iron for patchwork bits. I iron for births deaths and marriages, nothing else warrents it. Well, sewing does. 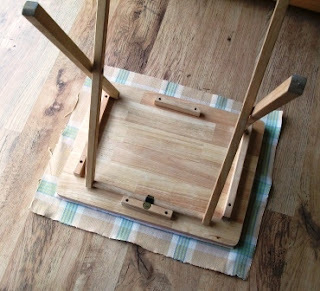 SS came back from university with a mini ironing board (what type of student was he? ), it was brilliant for sewing, but he has taken it with him to his new flat. Oh, you all make me laugh so much!! Ros: excited and ironing in the same sentence? Really?! 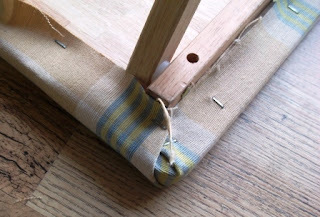 Whitney-Anne: love the idea of travel iron for patchwork - inspired! Polly: love it! Births deaths and marriages!! I am with you on that! What a fantastic idea. I'm off to find a table tomorrow. Oh he's just a neat freak while I'm ...erm, well, I'm not! I actually enjoy ironing but hate dusting and hoovering so feel free to create a tutorial making those chores easier too! Hi, I just discovered Blog Train the same way you did in your more recent post and decided to stop by at your blog. Fantastic DIY ideas! Very clever space saving idea. Thanks. I actually love ironing, just never do it. I actually lost my iron for 12 months once (see, I never iron). My friend found it - it was in plain view, right next to my telephone lol. Talk about domestic blindness haha!! I have a table like this, but it holds my BigShot machine. Better get me a new one, so I can have a sewing ironing board (for when I actually clear off my sewing table and use it again!!). Thanks again for a great tute!! Very cute idea. I made this but I recycled my old ironing board cover. I cut the good part of the old cover. It did not cost me anything to do this. 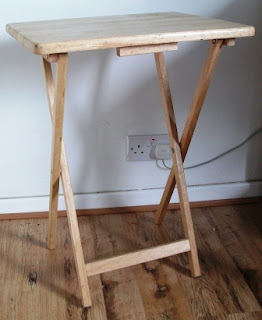 I just love this idea and am in search of a used table to recycle. Can you please clarify what is meant by thermal batting? Are you referring to Insul Brite or something else? Thank you. You are a genius! I will put this next to me when I sew.... no more popping up to iron a seam! You ROCK! Best idea EVER! i wouldn't mind doing a tone of dishes but ironing is not my coffee cup i hate it that much. it takes me time to find the courage to do it. that is.